What Is The Java Community? At a very high level, Java Community is the term used to refer to the many individuals and organisations that develops, innovate and use Java technology. This community includes developers, as individuals, organisations, businesses, and open-source projects. 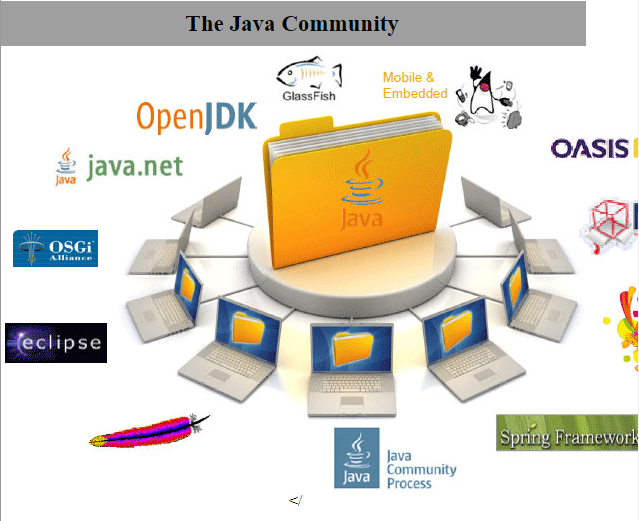 It is very for you to download and use Java libraries for non-Oracle sources within the Java community. The JCP produces the JSRs that outline the standards of the Java platform. The behavior Of the JCP itself is also defined and improved through the JSR process. The JCP is evolving and its improvements are defined in JSR-348 . JSR-348 introduces changes in the areas of transparency , participation, agility, and governance. Transparency : In the past, some aspects of the development of a JSR may have occurred behind closed door. Transparent development is now the recommended practice. Participation: Individuals and Java User Groups are encourage to become active in the JCP. Agility: Slow-moving JSRs and now actively discourage. Governance: The SE and ME expert groups are merging into a single body. The Executive Committee( EC) plays a major role in the JCP program. Members of this group has to analyze, comment , vote and decide on the approval of all the JSRs submitted to the program. Besides being responsible for guiding the evolution of the entire platform, the EC and the whole JCP program are also responsible for the JCP program itself, keeping it in adherence to what the community expects from the program and its members. reviewing and voting to approve or reject new JSRs proposal. reviewing and voting to approve or reject public review drafts. deciding when JSRs should be withdrawn. collaborating on revisions to the JCP program. Because it is open-source. , OpenJDK enables users to port Java to operating systems and hardware platforms of their choosing .Port are underway for many platforms(besides those already supported) including FreeBSD, OpenBSD, NetBSD and Max OS X.
Java is available free of charge. However, Oracle does provide pay-for Java solutions. The Java SE Support Program provides update for end-of-life Java versions. Java (Oracle JDK) is freely available at no cost. Oracle offer advanced commercial solutions at cost. The previously offered "Java For Business " program has been replaced by Oracle Java SE Support, which provide access to Oracle Java SE Advanced and Oracle Java SE Suite binaries. The Java Specification Requests (JSR) is the document that starts an enhancement on the Java Platform. Whenever a member of the JCP program sees an opportunity to improve the platform , the create a JSR describing the opportunity and submit it for revision. The JSR then passes through the series of stages until it get released or discarded. The First stage is where an individual or a company that has identified an opportunity writes about it. The artifact expected from this stage must conform to the JSR Submission Template. After having a template properly filled, the author then submits it to the JCP program. If everything is OK with the submission , Then the JSR enters the review phase. 4. When the JSR get approved by the EC, the Specification Leads start forming an Expert Group and a team of contribution to work on the specification.After having the whole crew defined, they start working on the Early Draft Review. 5. The goal of Early Draft Review is to get the draft specification into a form suitable for Public Review as quickly as possible. The public participation in this stage is desired and important as they can raise architectural and technological issues that can improve the specification. 6. This stage is reached when the JSR is very close to its full definition and EG is ready to start d developing the Reference Implementation. The goal of this stage is to collect some last feedbacks and to give the chance to the community to contribute one last time before moving to the Proposed Final Draft. 7. If the Public Review is successful , the Expert Group then prepares the Proposed Final Draft of the specification by completing any revisions necessary to respond the comments .During this phase the JSR gets finished both as a specification and as a implementation . Also the Specification Leads and the Expert Group is responsible for completing the TCK. 8. After having all the documents, the implementation and the TCK finished , the Specification Leads sends the Final Draft of the Specification to the JCP program to have the Final Approval Ballot initiated. In case , of the successful ballot , after a maximum of 14 days, the specification gets published on the JCP website with its RI.The JSR then gets in a Maintenance mode where small updates to it might occur.